Business links between Scotland and Norway are to be strengthened with the launch of a new Shetland to Bergen air route. 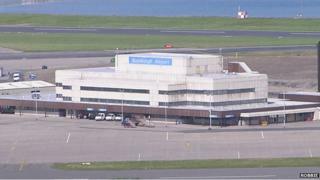 Norwegian airline Bergen Air Transport will launch a twice-weekly service from Sumburgh Airport on 24 November. It will use a 12-seat Beechcraft King Air B200 aircraft on the route. The new service hopes to capitalise on established trade links between Shetland and Norway, particularly in the energy and marine sectors. Bergen, situated on the west coast of Norway, is a major hub for the oil and gas and marine industries, including seafood and fish farming. The new service is being supported by funding of £70,000 from economic development agency Highlands and Islands Enterprise (HIE). It will be open to leisure passengers, with Monday and Thursday departures allowing for extended weekend breaks. HIE Shetland area manager Rachel Hunter said: "There are already strong ties between Shetland and Norway, especially in the oil and gas and aquaculture industries. "Good transport links are essential to a successful and globally competitive region. "These new weekday flights will allow much greater ease of travel, with businesses benefiting from reduced travel costs and improved productivity through reduced time spent travelling. "Over time, it is hoped that this improved connectivity will facilitate even stronger business links between Shetland and Norway."